I’ve been talking about tomatoes – tomatoes and the media, my funny/strange ways with tomatoes, and a series of tomato salads that keep these fruit in the spotlight (and away from my greens!). And why not? It’s been quite warm of late (typhoons then this heat…the weather is leaving me befuddled) and the tomatoes are almost jumping of their own accord into my market bag, so I think it’s apt that I post about my tomato salads. If I have a whole bunch of tomatoes that needs to be used up right away, or if the mood strikes me, I slow-roast them in my oven. This method is also good with less than stellar tomatoes as it concentrates the sugars in particular and the flavor in general. It is also cheaper to do this than to buy fancy (and imported) bottled sun-dried tomatoes. You can also control how dry you’d like your tomatoes…I prefer mine semi-dried, with a little “meat” still on them. – Slice tomatoes: no rules here – slice them as haphazardly or as uniform as you’d like. For these cherry tomatoes I left the smallest ones whole and sliced the majority in half…for the biggest ones I cut them in quarters. – Slice the onion into thin half moons – as thin as you can manage. – Toss onions and tomatoes together and dress with a couple of good glugs of olive oil and some dashes balsamic vinegar. Sprinkle with sea salt (as good a finishing salt as you have – and don’t be shy about it) and freshly cracked black pepper. I always do this to taste but if you want a guide just use 3 parts oil to 1 part vinegar, toss, taste, and adjust. Toss carefully…you don’t want battered tomatoes! This is another way I like my tomatoes – with onions. Good and proper, breath-busting, red onions. Held together with sweet balsamic vinegar, olive oil, and salt and pepper (lots!) this salad is not shy with its flavour. It’s wonderful with anything grilled or fried…though we’ve had it with everything from roast chicken to adobo and it goes splendidly with those too. For this salad I use any nice or interesting tomatoes that come my way. I’ll get different kinds, shapes, sizes, colors (I sometimes like to add some green tomatoes here) and cut them up into random chunks (just trying to remain in the vicinity of the same size). I used cherry tomatoes in this particular one because I came across some cute specimens in the market 🙂 So don’t limit yourself! Feel free to grab what looks good to you. 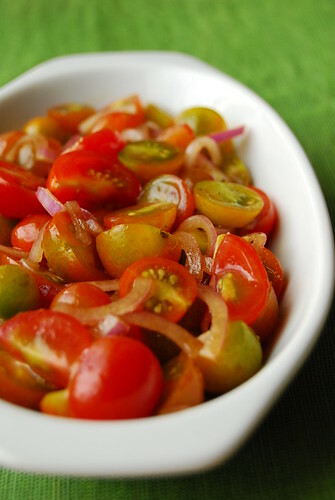 Some also prefer to “de-fang” their onions by soaking them in water and salt (then rinsing and draining) to remove some of the bite, but it’s exactly that raw-onion-bite against the sweet tomatoes that I love in this salad, just make sure you slice them as thin as you can.